Being an otaku is a great thing and Umaru knows it. She spends her days lazing about the house eating potato chips, drinking cola, and playing games. She loves to wear her hamster hoodie as she rolls on the ground with excitement over the newest issue of her favorite magazine. Her brother, a hard working salaryman, gets annoyed by her habits, but if she didn't excel at school he might just make a bigger issue out of it. 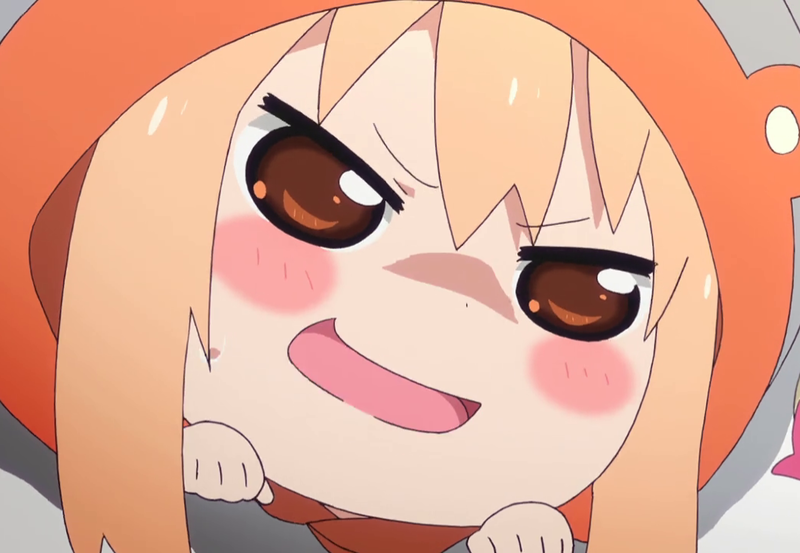 Umaru is actually the ideal schoolgirl on the outside. She's popular, intelligent, and she's also much taller. This may sound strange, but when Umaru enters "otaku" mode she magically shrinks to chibli size and becomes almost unrecognizable. So the "regular" Umaru looks nothing like her true nerdier self. Anime magic at work. Her school friends do not suspect she is an "otaku" and Umaru does nothing to dispel their vision of her. However, Umaru isn't the only one with a nerdy trait or two. At 12 episodes that are 24 minutes apiece, Himouto! Umaru-chan seems to have more in common with anime series that have episodes that clock in at only four minutes. One episode of this series really feels like a series of shorts pieced together. It's kind of like Looney Tunes but only if Bugs Bunny never left his rabbit hole and played video games all the time. There really isn't much in the way of plot, but since this is a comedy (and a good one at that) it can largely get away with much of the characterization (or lack thereof) going absolutely nowhere. This clearly wasn't going to be the anime to discuss any of the heavier social implications of what Umaru is doing. Essentially pretending to be someone else so she doesn't invite criticism on her chosen lifestyle. Nor does she seem to learn anything from watching the ones she is trying to deceive be nerdy themselves without the elaborate deception. At times I thought for sure Umaru's secret would slip, but it never did. So it would seem that there could be another season with more otaku-related hijinks in the future. The series did feel a little long at times and not all of the jokes hit the mark, but it was much better than many other anime that tried to go the same route. Pretty enjoyable stuff. I'd watch more if there was a second season. 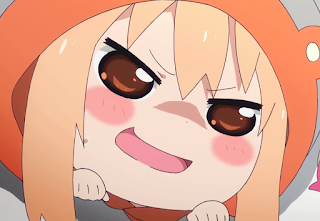 I just hope that Umaru improves her diet. Cola and ramen can only work so much magic.